ERIC QUIZON is happy to direct a new and innovative travel show, “Happy Life”, that will air starting next Sunday, 9:30 AM, on GMA News TV, produced by White Lion Media Productions under ex-Gov. Chavit Singson and with his daughter Kim Singson as president. “Doing a travel show is not new to me since I hosted ‘Road Trip’ for over two years before,” says Eric. “But this one is different as it’s a travel show for a cause and with a noble purpose. While we are showing the most beautiful spots in our country, we are also doing a pay-it-forward kind of show as we choose a lucky recipient in each place we go to and he or she will then receive a big surprise. For our pilot episode, we go to Ormoc in Leyte and we chose a 76-year old female farmer, Gabrina Luna, who’s been farming since she was 10 years old and has 12 kids. She was chosen as she’s so selfless, caring for her grandchildren who live in a small barong -barong. Si Gov. Singson, pinagamot yung apo niyang may sakit and also gave her a new house and lot kaya tuwang-tuwa siya. We even provided for her new home’s electricity and water supply. Sa susunod na episode naman, we chose a barber, si Mang Badong, who’s helping a lot of street children at binigyan namin siya ng sarili niyang bagong barber shop. Gusto namin to give people a happy life, masayang buhay." The show is hosted by beauty queens and models who act as guides in taking the viewers all around the Philippines: MJ Lastimosa, Bea Rose Santiago, Jamie Herrell, Mutya Datul, Giulia Zahar, Sophie Rankin and Anthea Murfet. Eric encouraged his brothers and sisters to also be donors and help, so you will see Epi and Vandolph Quizon and their other siblings doing their own sharing in one episode. 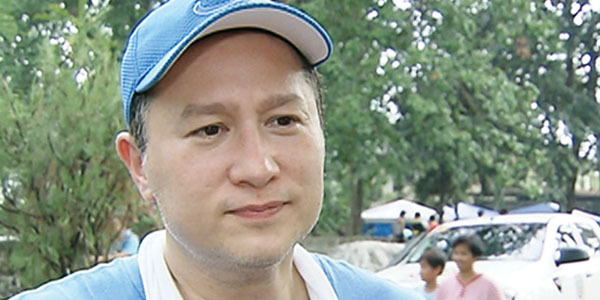 He also asked good friend Alice Dixson to share her blessings in an orphanage in Bacolod for their Christmas episode. Don’t miss “Happy Life” as it premieres on GMA News TV on December 11.